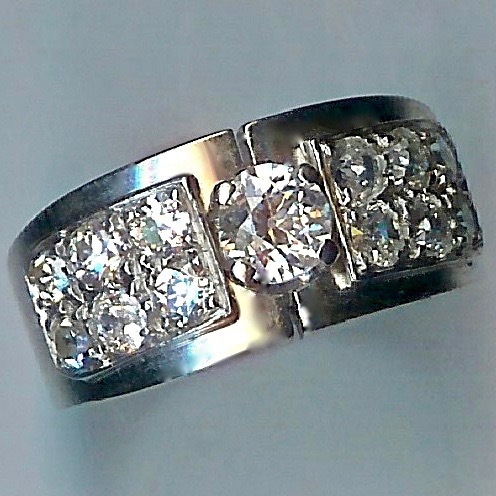 Wonderful Art Deco 1930's Diamond-set Band [SH7688] - £1,850.00 : loveVintageDiamonds.com, Your Vintage Diamond Dreams Come True! 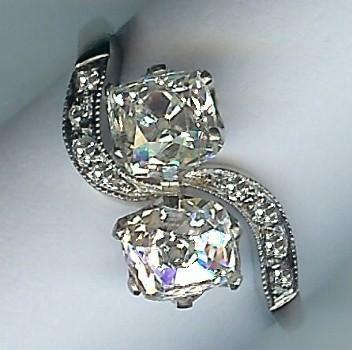 This is a particularly eye-catching Art Deco diamond-set band. Vintage, 1930's. Centre diamond is approx. 0.46cts, and there is a total diamond weight of approx.1.42cts. The band is graduated from approx. 9.5mms wide at crown to approx. 4mms wide at back. The ring is all white, marked 'PLAT' and tests as platinum throughout. Overall weight approx. 7.6gms. STONES: Rose-cuts, often referred to as European-cut. Internally clean, of high quality, approx. VS2 to SI2. Centre stone has one small nibble on edge unseen with naked eye. 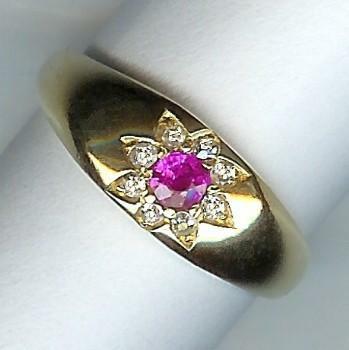 DIAMOND WEIGHT: Centre stone approx. 0.46cts. Approx. 1.42cts total. ITEM WEIGHT: approx. 7.6gms overall.